The Trochanter mealybugs Pseudococcus sorghiellus (Forbes) are small (at most 2mm), whitish, wax-covered insects that feed on plant roots (Fig. 1). Because of their size and life history, they are often overlooked but have been found in Southwestern Ontario. Trochanter mealybugs are part of a family of unarmored, scale insects that enjoy moist climates (Mani and Shivaraju 2016). More specifically, Trochanter mealybugs are root mealybugs and usually go unnoticed because they live and feed on the roots of soybeans (Fig. 2) and many other plants such as alfalfa, red and white clover, and corn. The affected soybeans may look like they have a potassium deficiency with yellowed leaf margins and/or stunted growth (Mani and Shivaraju 2016). It is native to the United States where it is considered a pest. 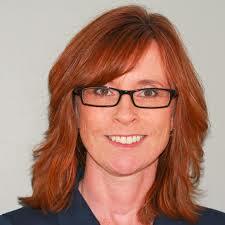 There have been sightings of this species in Southwestern Ontario for a few years but have only been found in small patches and thus do not seem to cause much harm. When mealybugs are young, they can move short distances from one plant to the next quite easily. They can also move with irrigation water; the waxy covering on their bodies helps them survive in water but their dispersal ability is quite limited (Mani and Shivaraju 2016). 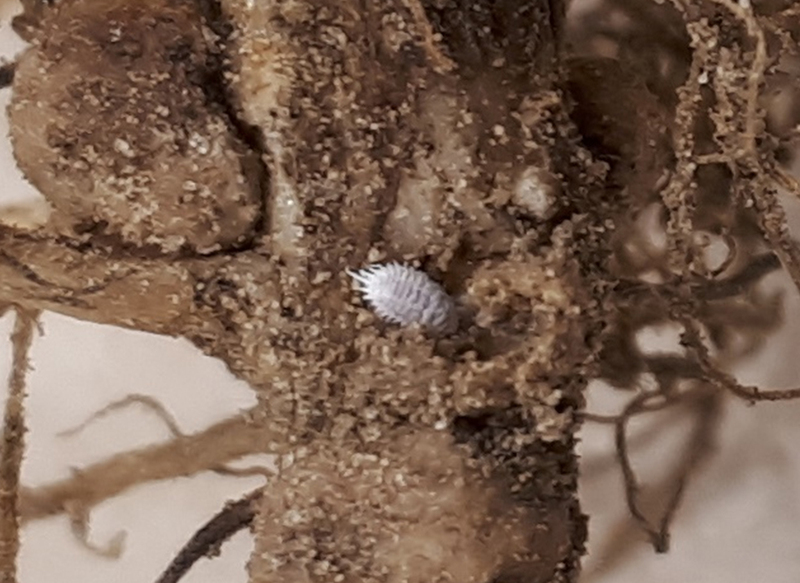 This summer, probably because of the wet spring, the Trochanter mealybug has been sighted in a soybean field in Harrow as well as a field near Chatham (O. Wally Pers. Comm.). Because of its patchy distribution and the fact that it does not seem to be doing much damage there is no need to panic but keeping an eye out for them is a good idea so that the distribution of this species can be monitored in the region. 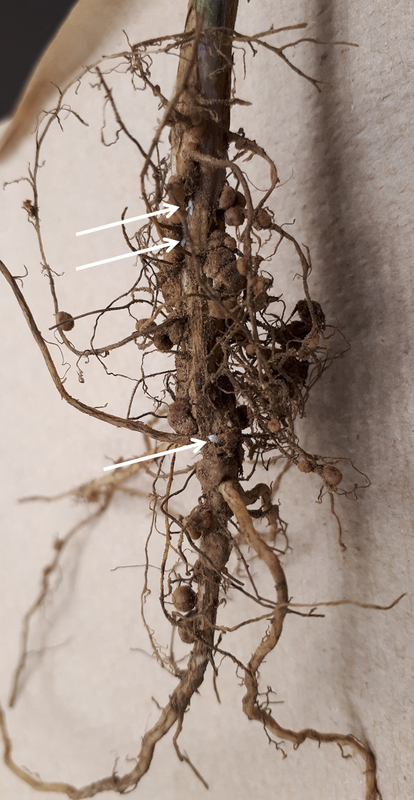 If, in your field, you see a patch of stunted soybean plants or think they may have potassium deficiency, pull out one of those plants and check the roots (Fig. 2). If there are oval waxy insects crawling around on the roots or in the soil surrounding it, you will know that there are trochanter mealybugs in that patch and your plants do not have a potassium deficiency. 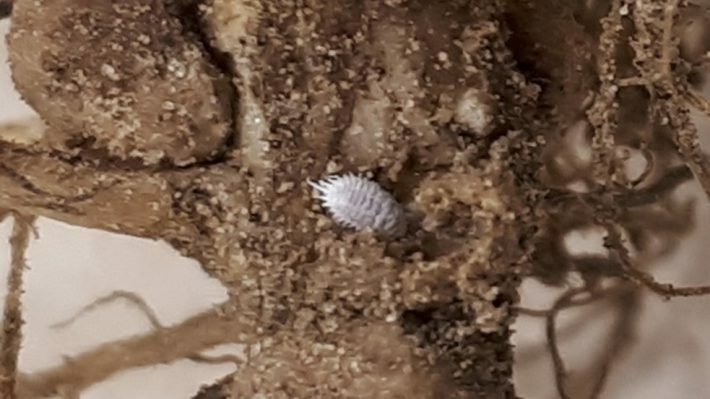 If you do find the Trochanter mealybug in your fields, please do not hesitate to contact me (julia.mlynarek@canada.ca or 519-738-1227). Should Soybeans be Planted Before Corn?